Central Valley Kings Foundation is a public benefit, not for profit corporation dedicated to supporting organizations that are committed to community and youth services. It affords other service organizations to become members of the foundation in order to take advantage of nonprofit status. By having a Trust Account with the foundation for raising funds, this allows member organizations to solicit donations giving donors a tax credit for their donations. The focus of the foundation is to improve the quality of life for community and youth in our communities. All donations and fundraising revenue go to charitable projects, student scholarships and administrative support to the functioning of the foundation such as taxes. It is a complete volunteer based organization and no officer receives any compensation for the work they do. If you are a charitable organization supporting community projects and youth programs, and want to join the foundation to be a part of a nonprofit 501(c)(3), contact us at cvkfoundation@gmail.com for more information. This Kiwanis Club has no BOUNDARIES! Meetings are held by conference call and email. Community service is in your local community. You do not have to travel to do community service. Get involved with your community to make it better for everyone. Make sure you check out their club pages on our site. The Foundation supports this club for the fine work they do in helping communities to improved the quality of life for all. We provide scholarships, feed the hungry and raise funds for many charitable causes. Donations are tax deductible. Kindly provide name and address to receive a receipt for tax purposes. Coastal Valley Kiwanis Club being has been opened in Central Valley Coast Area; that includes Santa Maria and surrounding communities! This club makes it possible for working members and home-bound parents to join a service club and participate in projects without attending face-to-face meetings during the day. This club meets by email, conference call or on the web. Your community service takes place in the community where you live. This is the only Kiwanis Club that has no geographic boundaries in this area! Contact Marie Bañuelos at cvckiwanis@gmail.com or give her a call at 559.639.3084 for more information. You can make a difference in your own community. 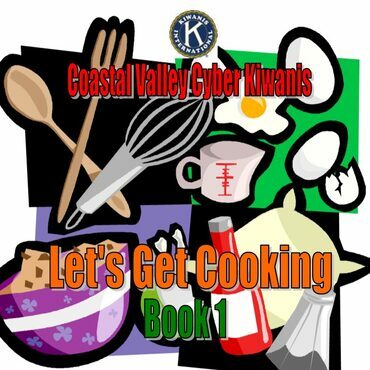 This is a cookbook with recipe contributors from Kiwanis and community. All proceeds goes to scholarships and community service. Make sure you include your email address with your payment. This is a digital copy which you can make a paper copy if you want a paper book. Help make a difference to children and communities.